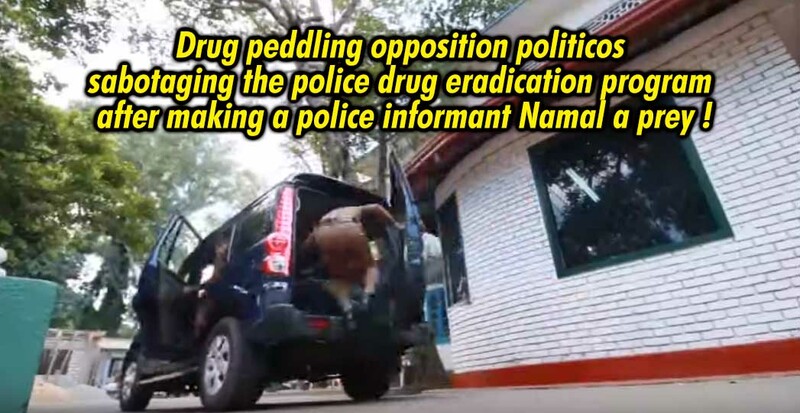 LEN - www.lankaenews.com | Drug peddling opposition politicos sabotaging the police drug eradication program after making a police informant Namal a prey ! Drug peddling opposition politicos sabotaging the police drug eradication program after making a police informant Namal a prey ! (Lanka e News -17.Sep.2018, 4.35AM) Capitalizing on a tape recording purported to be of one Namal Kumara Warakapola who was working as a police informant some time ago, a group of heroin peddlers and rogues of the opposition party ( it was during the Mahinda Rajapakse regime container loads of heroin were unloaded cannot be forgotten) have started a mudslinging campaign against the Police in order to scuttle the successful raids launched to seize heroin in the Gampaha district by the IGP recently .. This drugs eradication operation was commenced by IGP Poojitha Jayasundara and Deshabandu Tennekoon on 19 th August in Western , Northern and Gampaha districts , and it is proving most successful. Owing to this the drug peddlers in Gampaha are in a deep predicament with the raids exceeding 200 %. Inspired by this it is the aim and ambition of the police to completely eradicate the drug scourge in Gampaha within 2 months. Due to this success , the opposition bankrupt politicians who are godfathers are trying to make the police informant a prey and are slinging mud at the Police. This was best illustrated when Mahindananda Aluthgamage a confirmed ace rogue declared ‘ Now I have no faith in the Police. If the police asks me to come , I shall not go.’ It can be inferred from this the rogues by referring to the tape recording of the police informant are trying to escape from the net of the police. Namal Kumara is a police informant who successfully crept into Sinhala racist organization and assisted in the arrests of extremists including Arambepola Rathanassara , Dan Priyasad , Janitha Meepage and Amith Weerasinghe . Namal Kumara had walked over 11 kilometers alone in the night to apprehend Amith Weerasinghe. He himself has disclosed that. DIG Nalaka Silva of the Terrorism prevention unit had promised Rs. 600,000.00 to Namal as a reciprocation for the information supplied by him .However the promised amount was not paid. The opposition heroin peddlers capitalizing on the resentment of Namal over this have made the latter an easy prey for their foul designs. . The media briefing held recently was an outcome of that. It has by now come to light some of the the recorded tapes were given to him by the heroin peddling opposition bankrupt politicos. In any case one objective was clear in that. That is , to drive a wedge between the president and the prime minister. The president and P.M. who perceived the actual aims and objectives , instructed the IGP to conduct an investigation immediately and to report. The IGP has already entrusted this task to the CID.